Concept cars have always been a big part of the auto industry. Whether they foreshadow an upcoming model, highlight various ideas that might make it into production, or just feature over-the-top elements just because the automaker can, they have been wowing the public for more than 70 years. One of the early pioneers of the concept car trend was the Chrysler Corporation. 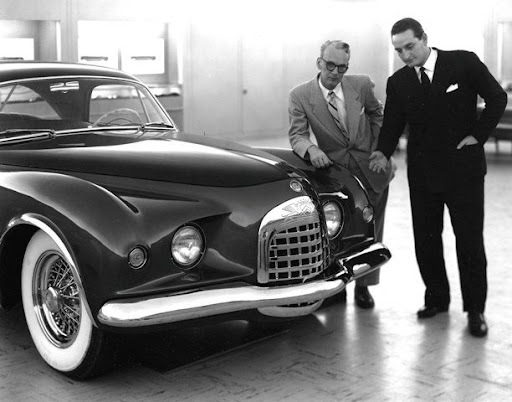 Chrysler was steeped in design history from the very beginning. From the lavish, Art Deco Chrysler Building in New York City that was commissioned by Walter P. Chrysler himself and opened in 1930, to the ultra-streamlined Chrysler and Desoto Airflow cars of 1934 – 1937, Chrysler was always looking for new ways to push the design envelope. The 1938 Buick Y-Job, designed by Harley Earl at rival General Motors, sparked the concept car craze. Chrysler quickly answered the call with the 1940 Thunderbolt Concept. The Thunderbolt was designed by Alex Tremulis, the same guy that came up with the space-aged Tucker a few years later, and LeBaron designer Ralph Roberts. Like the Airflows, the Thunderbolt was extremely streamlined, with no running boards, and skirts covering the wheels. Unlike the large Airflows, the Thunderbolt was a sporty, two-seat roadster. It featured a retractable hardtop, something that hasn’t really been available on a production two-seat sports car until very recently. Six Thunderbolts were actually produced on Chrysler New Yorker chassis, and four of them are still extant today. 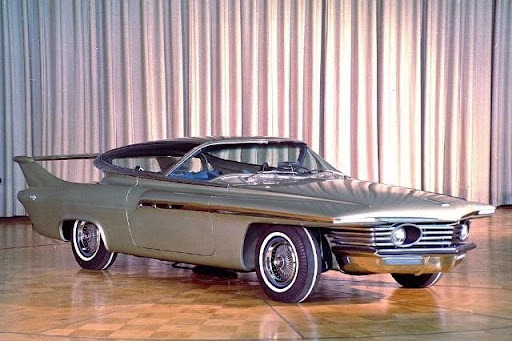 Then, right as the Thunderbolts were getting some attention—bang!—along comes the Chrysler Newport Concept. And they built six of those, too, giving Chrysler twelve shiny, new concept cars to travel around and dazzle people. That’s a lot, considering that GM, the dream car pioneer, only had the one Y-Job. Tremulis and Roberts designed the Newport as well. This one, also built on an Imperial chassis, featured a classic dual-cowl design with flowing side panels. One of them even paced the 1941 Indianapolis 500. The Thunderbolts and Newports marked a pretty exciting time in Chrysler concept car history, but the snowball was really growing in 1949 when Chrysler president K.T. Keller hired Virgil Exner. Exner had on-the-job training by the most influential stylists of his day. He had worked for Harley Earl at General Motors in the 1930s, and moved on to work under the great designer Raymond Loewry at Studebaker by the late ‘30s/early ‘40s. Exner hired on at Chrysler as part of the Advanced Styling Group. In spite of breakthrough vehicles like the Airflows and the early concept cars, most Chrysler Corporation production vehicles were pretty stodgy. They were tall; they were narrow; they were generic. Exner set out to change that. Luigi Segre of the Italian design house Carrozzeria Ghia became good friends with Exner, and their relationship resulted in several Ghia-bodied concept cars. Known as “Idea Cars” in Chrysler circles, these Italian beauties enhanced Chrysler’s image with their low, racy lines and features like intricate wire wheels. Some of these cars actually made it into limited production, and were owned by the likes of Frank Sinatra and Dean Martin. Exner also transformed Chrysler’s production lineup, producing the “Forward Look” of the late 1950s with impossibly low rooflines and radically stylized fins. Chrysler produces memorable concept cars to this day. But some of the most beautiful, and most usable cars came from the early days of dream car design. 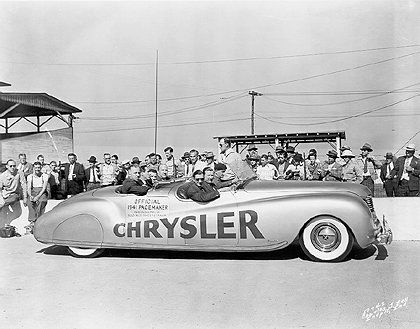 Photos from the Chrysler Corporation archives.